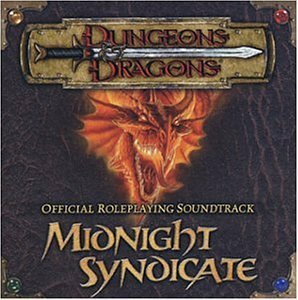 MIDNIGHT SYNDICATE brings you the first-ever officially licensed soundtrack to the roleplaying classic that started it all. Ancient underground temples, dark knights, mysterious labyrinths, sorcerors, forgotten tombs, enchanted forests, and creatures await you on this new release containing over an hour of orchestral music from the masters of gothic/horror soundscape. It's the ultimate musical accompaniment to the DUNGEONS & DRAGONS roleplaying game, and promises to take listeners on an epic adventure through the darkest corners of their imagination. Working closely with the game designers at Wizards of the Coast, this CD is a simple yet dynamic way for gamers to take their adventuring sessions to the next level.